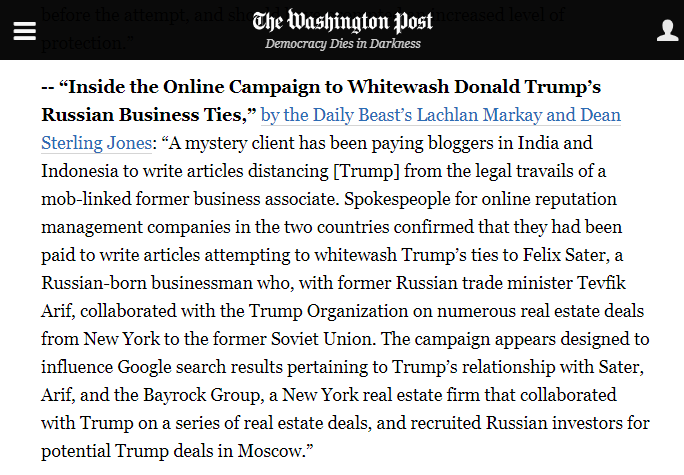 Since late last year, I’ve been researching an online PR campaign seemingly intended to manipulate Google’s search results in order to obscure unflattering news articles about Donald Trump’s Russian business ties. 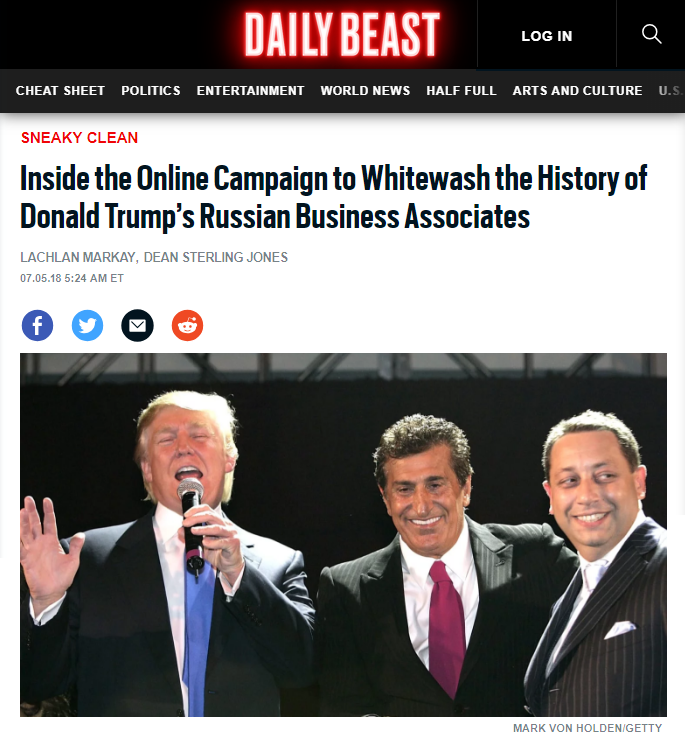 Yesterday, the story was published in The Daily Beast. Sater—who once had an office at New York’s Trump Tower, Trump Organization business cards, and claims to have worked as a senior adviser to Trump—has recently emerged as a key figure in the federal investigation led by special counsel Robert Mueller into Russian meddling in the 2016 presidential election. The Daily Beast previously reported that a Pakistani blogger had been paid to write an article for the Huffington Post’s now-defunct contributor platform hailing the dismissal of [a civil tax fraud lawsuit against Sater]. That blogger, who went by the handle Waqas KH, said his client, whom he declined to name, had provided the text of the piece in full. 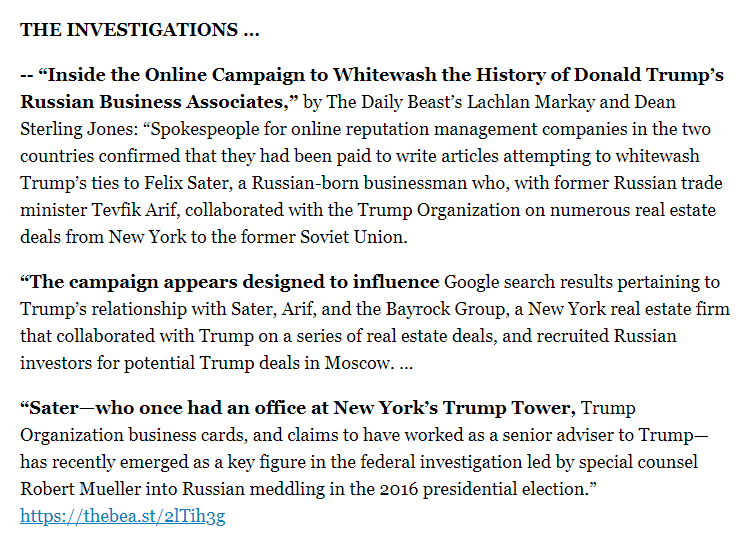 HuffPost is a prominent U.S. news source, but on more obscure platforms, used explicitly for search-engine optimization, over 50 other stories have popped up hyping the lawsuit’s dismissal and attempting to insulate Trump from controversy involving Sater and Bayrock. The articles were published over an eight-month period, from September 2017 through June 2018. “Certainly now that Trump is President of the United States, there is not likely to be any further implications for him in this case,” declared a November article at a since-deleted website billing itself as a forum for a “business development specialist.” The article was written by Abhishek Chatterjee, who owns an Indian SEO business that offers to place articles on a network of 900 websites for $20 apiece. The story was subsequently covered by The Washington Post, Politico, ABC News, and others. So proud of you! Well done, you really have come of age as an investigative journalist!